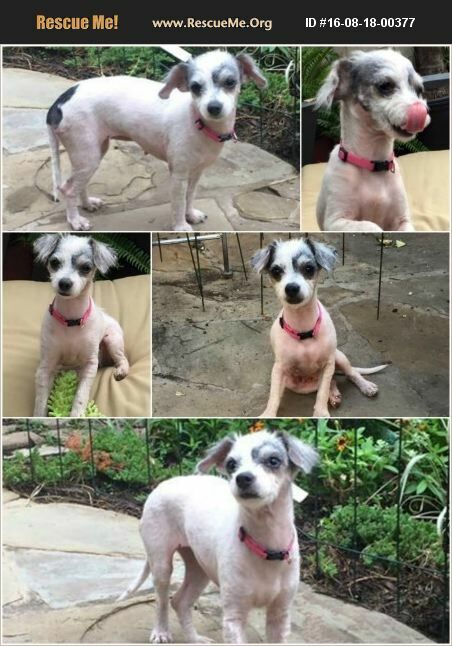 JoJo is a 2 year old female Shih Tzu Mix . She came to us from Harris County Animal Shelter after her owners surrendered her because of a move. She is extremely shy, fearful of large dogs pretty unsocialized to people and most animals. But now being in here for a little over a week she is starting to develop a cute playful personality. She doesn't always come to you when you call her, but is becoming more confident and that seems to be happening less and less. When a big dog approaches her she yelps as if she is being attacked. She loves playing with dogs her size and will chase and roughhouse with them for hours. She loves sleeping with you and sitting in your lap. She is loving the attention and interacting with a family. Not sure if she is house trained but does seem to be crate trained as we have had her a short time and she is very nervous at times and has had several accidents. But is crate trained. She is HW negative, had rabies, bordatella, parvo/distemper booster, on heartworm prevention and flea prevention. She was spayed and microchipped. JoJo would be best in a home of a family with out small children and without large dogs. She is about 6 lbs and does really well with dogs around that size. If you are interested in making Jojo part of your family please follow the instructions below: The adoption fee is $200. To ADOPT you will need to go to our website @ www.furgivingheartsrescue.com Go to the FORMS page of the website and click on the button to download the application adoption. Then you can either save it to your computer or print it. If you save it to your computer and fill it out on the computer you can email it back in. If you print it and fill it out you can scan and email it back or fax it. To fax it in please send it to 903-705-7727 or email it to our email address at; furgivingheartsrescue@yahoo.com If you know someone interested in applying for adoption and they do NOT have access to a computer and are not able to access the foster application or adoption application please send us a private message we can make arrangements to get them one. Thank you!! !